Klaus Augenthaler (born 26 September 1957 in Fürstenzell, near Passau in Bavaria, Germany) is a former football player and now manager. Augenthaler played generally in the position of central defender or, especially in the later part of his career, libero. No-one has yet to match Klaus Augenthaler's record, with its seven championship and three German Cup triumphs at Bayern and a 1990 World Cup winners' medal. Klaus Augenthaler pursued and harvested honours like no other player, making him the most successful individual in Bundesliga history. 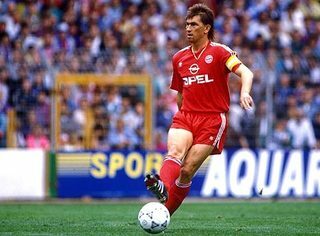 At Bayern, 'Auge' won the championship seven times (1980, 1981, 1985, 1986, 1987, 1989, 1990), the DFB German Cup three times (1982, 1984, 1986), and was twice a European Champions Cup losing finalist (1982, 1987). 'Auge' made 404 appearances for Bayern and 27 for Germany, scoring 52 top flight goals. Easily the most famous of these came on 19 August 1989 when he fired Munich's winner in a 1-0 away victory against Eintracht Frankfurt. The player, captain from 1984 to 1991 and filling the libero position at the time, beat Frankfurt keeper Uli Stein with a shot from the halfway line, earning the "Goal of the Season" and "Goal of the Decade" accolades. His nickname 'Auge', derived from his surname but meaning "the eye" in German, merely hinted at his ability to read the action and control a match from the back, initially as a centre-half and later in his career as a classic libero.